SAY CHEESE This image of a faraway galaxy cluster, released November 2, was taken with Hubble before the space telescope's recent malfunctions. Hubble returned to work on October 26. Hubble worried astronomers when it ran into unexpected trouble recently, forcing mission scientists to put it into safe mode while they sorted the problem out. But the space telescope has more than made up for its time off since returning to work on October 26. "Hubble is back to observing galaxies and stars, implementing programs that scientists around the world have proposed months ago," says senior project scientist Jennifer Wiseman, who is based at NASA's Goddard Space Flight Center in Greenbelt, Md. In recent days, Hubble has monitored the collision of distant galaxies. And it has studied the flares around faraway red dwarfs, or dim low-mass stars, to see if the flares might fry any orbiting planets, which would probably mean the worlds are uninhabitable (SN: 06/24/17, p. 18). Since launching in 1990, Hubble has provided some of the most captivating images of the universe. When it ran into trouble on October 5, the telescope's operations team quickly uncovered the cause: One of Hubble's gyroscopes, which track the speed at which the telescope rotates, had malfunctioned (SN Online: 10/10/18). Scientists activated a backup gyroscope the next day, but it jammed. During three weeks of tinkering, NASA engineers had Hubble make turns and switch between different operational modes to clear any blockage from the backup gyroscope's components. The maneuvers worked, and the telescope is now "running smoothly and nominally" again, says deputy mission head Helmut Jenkner, based at the Space Telescope Science Institute in Baltimore. 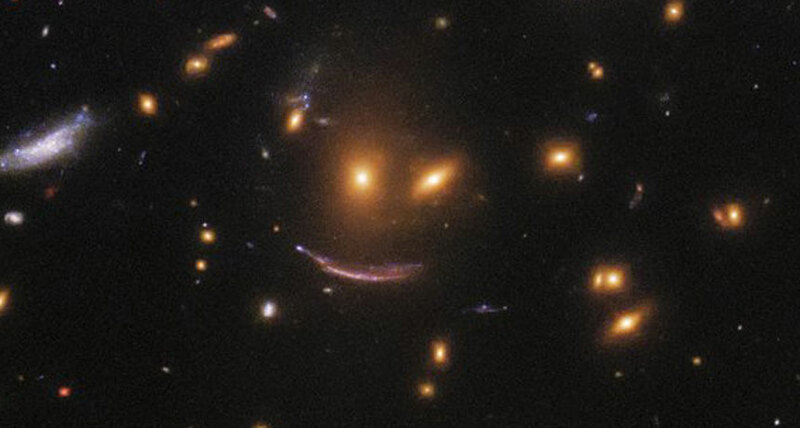 The newest Hubble images released by NASA include a patch of sky showing three galaxies in a galaxy cluster in the configuration of a smiley face, as the light from one galaxy is gravitationally lensed, or warped by passing a massive object, to appear as an arc-shaped smile. Another new image shows the star-making Serpens Nebula, found nearly 1,300 light-years away, with a young star casting a batlike shadow on surrounding gas clouds. Both images were snapped before Hubble's malfunction. Astronomers are rejoicing with Hubble's return. "I feel as if a relative has come out of the hospital!" says Robert Kirshner of the Harvard-Smithsonian Center for Astrophysics in Cambridge, Mass.